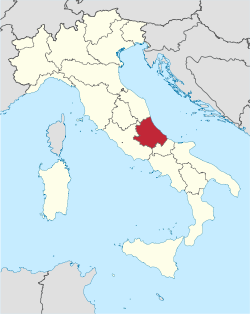 Abruzzo (pronounced [aˈbruttso]) is a region in Italy, its wastren border lyin less than 50 miles (80 km) due east o Roum. Abruzzo borders the region o Marche tae the north, Lazio tae the wast an sooth-wast, Molise tae the sooth-east, an the Adriatic Sea tae the east. Although it is geographically mair o a central than soothren region, ISTAT (the Italian statistical authority) considers it pairt o Soothren Italy, a vestige o Abruzzo's historic association wi the Kinrick o the Twa Sicilies. Wikimedia Commons haes media relatit tae Abruzzo.